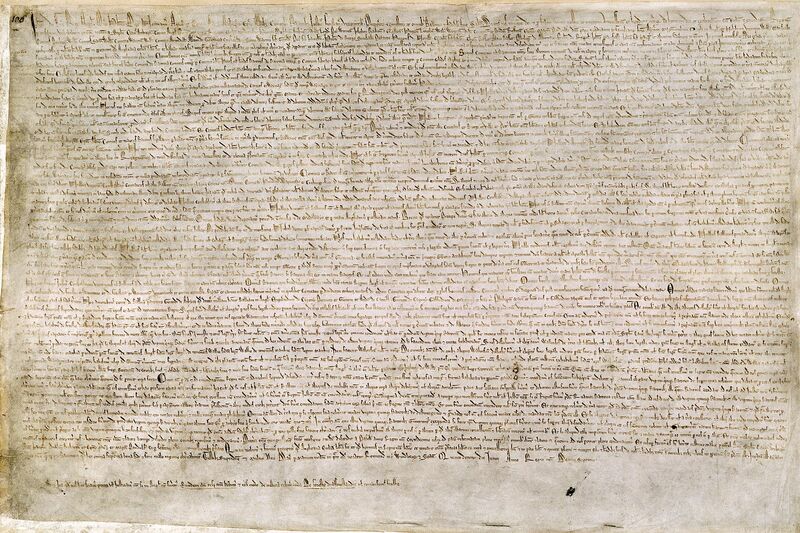 Note: In order to put Magna Carta in context, read the Wikipedia Magna Carta title on Open iPub first if you are not familiar with the history. (12) No `scutage' or `aid' may be levied in our kingdom without its general consent, unless it is for the ransom of our person, to make our eldest son a knight, and (once) to marry our eldest daughter. For these purposes only a reasonable `aid' may be levied. `Aids' from the city of London are to be treated similarly. (26) If at the death of a man who holds a lay `fee' of the Crown, a sheriff or royal official produces royal letters patent of summons for a debt due to the Crown, it shall be lawful for them to seize and list movable goods found in the lay `fee' of the dead man to the value of the debt, as assessed by worthy men. Nothing shall be removed until the whole debt is paid, when the residue shall be given over to the executors to carry out the dead man's will. If no debt is due to the Crown, all the movable goods shall be regarded as the property of the dead man, except the reasonable shares of his wife and children. (32) We will not keep the lands of people convicted of felony in our hand for longer than a year and a day, after which they shall be returned to the lords of the `fees' concerned. (33) All fish-weirs shall be removed from the Thames, the Medway, and throughout the whole of England, except on the sea coast. (42) In future it shall be lawful for any man to leave and return to our kingdom unharmed and without fear, by land or water, preserving his allegiance to us, except in time of war, for some short period, for the common benefit of the realm. People that have been imprisoned or outlawed in accordance with the law of the land, people from a country that is at war with us, and merchants - who shall be dealt with as stated above - are excepted from this provision. (43) If a man holds lands of any `escheat' such as the `honour' of Wallingford, Nottingham, Boulogne, Lancaster, or of other `escheats' in our hand that are baronies, at his death his heir shall give us only the `relief' and service that he would have made to the baron, had the barony been in the baron's hand. We will hold the `escheat' in the same manner as the baron held it. (49) We will at once return all hostages and charters delivered up to us by Englishmen as security for peace or for loyal service. ***here were some strange characters, not completely removed (50) We will remove completely from their offices the kinsmen of Gerard de Ath, Peter, Guy, and Andrew de Chanceaux, Guy de Cigogne, and in future they shall hold no offices in England. The people in question are Engelard de Cigogn, Geoffrey de Martigny and his brothers, Philip Marc and his brothers, with Geoffrey his nephew, and all their followers. * As soon as peace is restored, we will remove from the kingdom all the foreign knights, bowmen, their attendants, and the mercenaries that have come to it, to its harm, with horses and arms. * To any man whom we have deprived or dispossessed of lands, castles, liberties, or rights, without the lawful judgement of his equals, we will at once restore these. In cases of dispute the matter shall be resolved by the judgement of the twenty-five barons referred to below in the clause for securing the peace. In cases, however, where a man was deprived or dispossessed of something without the lawful judgement of his equals by our father King Henry or our brother King Richard, and it remains in our hands or is held by others under our warranty, we shall have respite for the period commonly allowed to Crusaders, unless a lawsuit had been begun, or an enquiry had been made at our order, before we took the Cross as a Crusader. On our return from the Crusade, or if we abandon it, we will at once render justice in full. * We shall have similar respite in rendering justice in connexion with forests that are to be disafforested, or to remain forests, when these were first aforested by our father Henry or our brother Richard; with the guardianship of lands in another persons fee, when we have hitherto had this by virtue of a fee held of us for knights service by a third party; and with abbeys founded in another persons fee, in which the lord of the fee claims to own a right. On our return from the Crusade, or if we abandon it, we will at once do full justice to complaints about these matters. * No one shall be arrested or imprisoned on the appeal of a woman for the death of any person except her husband. * All fines that have been given to us unjustly and against the law of the land, and all fines that we have exacted unjustly, shall be entirely remitted or the matter decided by a majority judgement of the twenty-five barons referred to below in the clause for securing the peace together with Stephen, archbishop of Canterbury, if he can be present, and such others as he wishes to bring with him. If the archbishop cannot be present, proceedings shall continue without him, provided that if any of the twenty-five barons has been involved in a similar suit himself, his judgement shall be set aside, and someone else chosen and sworn in his place, as a substitute for the single occasion, by the rest of the twenty-five. * If we have deprived or dispossessed any Welshmen of lands, liberties, or anything else in England or in Wales, without the lawful judgement of their equals, these are at once to be returned to them. A dispute on this point shall be determined in the Marches by the judgement of equals. English law shall apply to holdings of land in England, Welsh law to those in Wales, and the law of the Marches to those in the Marches. The Welsh shall treat us and ours in the same way. * In cases where a Welshman was deprived or dispossessed of anything, without the lawful judgement of his equals, by our father King Henry or our brother King Richard, and it remains in our hands or is held by others under our warranty, we shall have respite for the period commonly allowed to Crusaders, unless a lawsuit had been begun, or an enquiry had been made at our order, before we took the Cross as a Crusader. But on our return from the Crusade, or if we abandon it, we will at once do full justice according to the laws of Wales and the said regions. * We will at once return the son of Llywelyn, all Welsh hostages, and the charters delivered to us as security for the peace. * With regard to the return of the sisters and hostages of Alexander, king of Scotland, his liberties and his rights, we will treat him in the same way as our other barons of England, unless it appears from the charters that we hold from his father William, formerly king of Scotland, that he should be treated otherwise. This matter shall be resolved by the judgement of his equals in our court. * All these customs and liberties that we have granted shall be observed in our kingdom in so far as concerns our own relations with our subjects. Let all men of our kingdom, whether clergy or laymen, observe them similarly in their relations with their own men. ***Strange characters may have ended here. SINCE WE HAVE GRANTED ALL THESE THINGS for God, for the better ordering of our kingdom, and to allay the discord that has arisen between us and our barons, and since we desire that they shall be enjoyed in their entirety, with lasting strength, for ever, we give and grant to the barons the following security: * The barons shall elect twenty-five of their number to keep, and cause to be observed with all their might, the peace and liberties granted and confirmed to them by this charter. * If we, our chief justice, our officials, or any of our servants offend in any respect against any man, or transgress any of the articles of the peace or of this security, and the offence is made known to four of the said twenty-five barons, they shall come to us - or in our absence from the kingdom to the chief justice - to declare it and claim immediate redress. If we, or in our absence abroad the chief justice, make no redress within forty days, reckoning from the day on which the offence was declared to us or to him, the four barons shall refer the matter to the rest of the twenty-five barons, who may distrain upon and assail us in every way possible, with the support of the whole community of the land, by seizing our castles, lands, possessions, or anything else saving only our own person and those of the queen and our children, until they have secured such redress as they have determined upon. Having secured the redress, they may then resume their normal obedience to us. * Any man who so desires may take an oath to obey the commands of the twenty-five barons for the achievement of these ends, and to join with them in assailing us to the utmost of his power. We give public and free permission to take this oath to any man who so desires, and at no time will we prohibit any man from taking it. Indeed, we will compel any of our subjects who are unwilling to take it to swear it at our command. * If-one of the twenty-five barons dies or leaves the country, or is prevented in any other way from discharging his duties, the rest of them shall choose another baron in his place, at their discretion, who shall be duly sworn in as they were. * In the event of disagreement among the twenty-five barons on any matter referred to them for decision, the verdict of the majority present shall have the same validity as a unanimous verdict of the whole twenty-five, whether these were all present or some of those summoned were unwilling or unable to appear. * The twenty-five barons shall swear to obey all the above articles faithfully, and shall cause them to be obeyed by others to the best of their power. * We will not seek to procure from anyone, either by our own efforts or those of a third party, anything by which any part of these concessions or liberties might be revoked or diminished. Should such a thing be procured, it shall be null and void and we will at no time make use of it, either ourselves or through a third party. We have remitted and pardoned fully to all men any ill-will, hurt, or grudges that have arisen between us and our subjects, whether clergy or laymen, since the beginning of the dispute. We have in addition remitted fully, and for our own part have also pardoned, to all clergy and laymen any offences committed as a result of the said dispute between Easter 1215 AD and the restoration of peace. Given by our hand in the meadow that is called Runnymede, between Windsor and Staines, on the fifteenth day of June in the seventeenth year of our reign . John, by the grace of God, king of England, lord of Ireland, duke of Normandy and Aquitaine, and count of Anjou, to the archbishops, bishops, abbots, earls, barons, justiciars, foresters, sheriffs, stewards, servants, and to all his bailiffs and liege subjects, greeting. Know that, having regard to God and for the salvation of our soul, and those of all our ancestors and heirs, and unto the honor of God and the advancement of holy church, and for the reform of our realm, by advice of our venerable fathers, Stephen archbishop of Canterbury, primate of all England and cardinal of the holy Roman Church, Henry archbishop of Dublin, William of London, Peter of Winchester, Jocelyn of Bath and Glastonbury, Hugh of Lincoln, Walter of Worcester, William of Coventry, Benedict of Rochester, bishops; of master Pandulf, subdeacon and member of the household of our lord the Pope, of brother Aymeric (master of the Knights of the Temple in England), and of the illustrious men William Marshall earl of Pembroke, William earl of Salisbury, William earl of Warenne, William earl of Arundel, Alan of Galloway (constable of Scotland), Waren Fitz Gerald, Peter Fits Herbert, Hubert de Burgh (seneschal of Poitou), Hugh de Neville, Matthew Fitz Herbert, Thomas Basset, Alan Basset, Philip d'Aubigny, Robert of Roppesley, John Marshall, John Fitz Hugh, and others, our liegemen. 1. In the first place we have granted to God, and by this our present charter confirmed for us and our heirs for ever that the English church shall be free, and shall have her rights entire, and her liberties inviolate; and we will that it be thus observed; which is apparent from this that the freedom of elections, which is reckoned most important and very essential to the English church, we, of our pure and unconstrained will, did grant, and did by our charter confirm and did obtain the ratification of the same from our lord, Pope Innocent III., before the quarrel arose between us and our barons: and this we will observe, and our will is that it be observed in good faith by our heirs for ever. We have also granted to all freemen of our kingdom, for us and our heirs for ever, all the underwritten liberties, to be had and held by them and their heirs, of us and our heirs for ever. 2. If any of our earls or barons, or others holding of us in chief by military service shall have died, and at the time of his death his heir shall be of full age and owe "relief" he shall have his inheritance on payment of the ancient relief, namely the heir or heirs of an earl, 100 pounds for a whole earl's barony; the heir or heirs of a baron, 100 pounds for a whole barony; the heir or heirs of a knight, 100 shillings at most for a whole knight's fee; and whoever owes less let him give less, according to the ancient custom officers. 3. If, however, the heir of any of the aforesaid has been under age and in wardship, let him have his inheritance without relief and without fine when he comes of age. 4. The guardian of the land of an heir who is thus under age, shall take from the land of the heir nothing but reasonably produce, reasonable customs, and reasonable services, and that without destruction or waste of men or goods; and if we have committed the wardship of the lands of any such minor to the sheriff, or to any other who is responsible to us for its issues, and he has made destruction or waste of what he holds in wardship, we will take of him amends, and the land shall be committed to two lawful and discreet men of that fee, who shall be responsible for the issues to us or to him to whom we shall assign them; and if we have given or sold the wardship of any such land to anyone and he has there in made destruction or waste, he shall lose that wardship, and it shall be transferred to two lawful and discreet men of that fief, who shall be responsible to us in like manner as aforesaid. 5. The guardian, moreover, so long as he has the wardship of the land, shall keep up the houses, parks, fishponds, stanks, mills, and other things pertaining to the land, out of the issues of the same land; and he shall restore to the heir, when he has come to full age, all his land, stocked with ploughs and "waynage," according as the season of husbandry shall require, and the issues of the land can reasonably bear. 7. A widow, after the death of her husband, shall forthwith and without difficulty have her marriage portion and inheritance; nor shall she give anything for her dower, or for her marriage portion, or for the inheritance which her husband and she held on the day of the death of that husband; and she may remain in the house of her husband for fourty days after his death, within which time her dower shall be assigned to her. 9. Neither we nor our bailiffs shall seize any land or rent for any debt, so long as the chattels of the debtor are sufficient to repay the debt; nor shall the sureties of the debtor be distrained so long as the principal debtor is able to satisfy the debt; and if the principal debtor shall fail to pay the debt, having nothing wherewith to pay it, then the sureties shall answer for the debt; and let them have the lands and rents of the debtor, if they desire them, until they are indemnified for the debt which they have paid for him, unless the principal debtor can show proof that he is discharged thereof as against the said sureties. 10. If one who has borrowed from the Jews any sum, great or small, die before that loan can be repaid, the debt shall not bear interest while the heir is under age, of whomsoever he may hold; and if the debt fall into our hands, we will not take anything except the principal sum contained in the bond. 11. And if any one die indebted to the Jews, his wife shall have her dower and pay nothing of that debt; and if any children of the deceased are left underage, necessaries shall be provided for them in keeping with the holding of the deceased; and out of the residue the debt shall be paid, reserving, however, service due to feudal lords; in like manner let it be done touching debts due to others than Jews. 12. No scutage nor aid shall be imposed on our kingdom, unless by common counsel of our kingdom, except for ransoming our person, for making our eldest son a knight, and for once marrying our eldest daughter; and for these there shall not be levied more than a reasonable aid. In like manner it shall be done concerning aids from the city of London. 14. And for obtaining the common counsel of the kingdom anent the assessing of an aid (except in the three cases aforesaid) or of a scutage, we will cause to be summoned the archbishops, bishops, abbots, earls, and greater barons, severally by our letters; and we will moreover cause to be summoned generally, through our sheriffs and bailiffs, all others who hold of us in chief, for a fixed date, namely, after the expiry of at least forty days, and at a fixed place; and in all letters of such summons we will specify the reason of the summons. And when the summons has thus been made, the business shall proceed on the day appointed, according to the counsel of such as are present, although not all who were summoned have come. 15. We will not for the future grant to any one license to take an aid from his own free tenants, except to ransom his body, to make his eldest son a knight, and once to marry his eldest daughter; and on each of these occasions there shall be levied only a reasonable aid. 18. Inquests of novel disseisin, of mort d'ancester, and of darrein presentment, shall not be held elsewhere than in their own county courts and that in manner following,—We, or, if we should be out of the realm, our chief justiciar, will send two justiciars through every county four times a year, who shall, along with four knights of the county chosen by the county, hold the said assize in the county court, on the day and in the place of meeting of that court. 20. A freeman shall not be amerced for a slight offense, except in accordance with the degree of the offense; and for a grave offense he shall be amerced in accordance with the gravity of the offense, yet saving always his "contentment;" and a merchant in the same way, saving his "merchandise;" and a villein shall be amerced in the same way, saving his "wainage"—if they have fallen into our mercy: and none of the aforesaid amercements shall be impsed except by the oath of honest men of the neighborhood. 23. No village or individual shall be compelled to make bridges at river-banks, except those who from of old were legally bound to do so. 26. If any one holding of us a lay fief shall die, and our sheriff or bailiff shall exhibit our letters patent of summons for a debt which the deceased owed to us, it shall be lawful for our sheriff or bailiff to attach and catalogue chattels of the deceased, found upon the lay fief, to the value of that debt, at the sight of law-worthy men, provided always that nothing whatever be then be removed until the debt which is evident shall be fully paid to us; and the residue shall be left to the executors to fulfil the will of the deceased; and if there be nothing due from him to us, all the chattels shall go to the deceased, saving to his wife and children their reasonable shares. 28. No constable or other bailiff of ours shall take corn or other provisions from any one without immediately tendering money therefor, unless he can have postponement thereof by permission of the seller. 29. No constable shall compel any knight to give money in lieu of castle-guard, when he is willing to perform it in his own person, or (if he cannot do it from any reasonable cause) then by another responsible man. Further, if we have led or sent him upon military service, he shall be relieved from guard in proportion to the time during which he has been on service because of us. 32. We will not retain beyond one year and one day, the lands of those who have been convicted of felony, and the lands shall thereafter be handed over to the lords of the fiefs. 33. All kiddles for the future shall be removed altogether from Thames and Medway, and throughout all England, except upon the seashore. 34. The writ which is called praecipe shall not for the future be issued to any one, regarding any tenement whereby a freeman may lose his court. 35. Let there be one measure of wine throughout our whole realm; and one measure of ale; and one measure of corn, to wit, "the London quarter;" and one width of cloth (whether dyed, or russet, or "halberget"), to wit, two ells within the selvages; of weights also let it be as of measures. 37. If any one holds of us by fee-farm, by socage, or by burgage, and holds also land of another lord by knight's service, we will not (by reason of that fee-farm, socage, or burgage) have the wardship of the heir, or of such land of his as is of the fief of that other; nor shall we have wardship of that fee-farm, socage, or burgage, unless such fee-farm owes knight's service. We will not by reason of any small serjeanty which any one may hold of us by the service of rendering to us knives, arrows, or the like, have wardship of his heir of the land which he holds of another lord by knight's service. 38. No bailiff for the future shall, upon his own unsupported complaint, put any one to his "law," without credible witnesses brought for this purpose. 39. No freeman shall be taken or imprisoned or disseised or exiled or in anyway destroyed, nor will we go upon him nor send upon him, except by the lawful judgment of his peers or by the law of the land. 42. It shall be lawful in future for any one (excepting always those imprisoned or outlawed in accordance with the law of the kingdom, and natives of any country at war with us, and merchants, who shall be treated as is above provided) to leave our kingdom and to return, safe and secure by land and water, except for a short period in time of war, on grounds of public policy—reserving always the allegiance due to us. 43. If any one holding of some escheat (such as the honor of Wallingford, Nottingham, Boulogne, Lancaster, or of other escheats which are in our hands and are baronies) shall die, his heir shall give no other relief, and perform no other service to us than he would have done to the baron, if that barony had been in the baron's hand; and we shall hold it in the same manner in which the baron held it. 44. Men who dwell without the forest need not henceforth come before our justiciars of the forest upon a general summons, except those who are impleaded, or who have become sureties for any person or persons attached for forest offenses. 46. All barons who have founded abbeys, concerning which they hold charters from the kings of England, or of which they have long-continued possession, shall have the wardship of them, when vacant, as they ought to have. 47. All forests that have been made such in our time shall forthwith be disafforested; and a similar course shall be followed with regard to river-banks that have been placed "in defense" by us in our time. 48. All evil customs connected with forests and warrens, foresters and warreners, sheriffs and their officers, river-banks and their wardens, shall immediately be inquired into in each county by twelve sworn knights of the same county chosen by the honest men of the same county, and shall, within forty days of the said inquest, be utterly abolished, so as never to be restored, provided always that we previously have intimation thereof, or our justiciar, if we should not be in England. 49. We will immediately restore all hostages and charters delivered to us by Englishmen, as sureties of the peace or of faithful service. 50. We will entirely remove from their bailiwicks, the relations of Gerard Athee (so that in future they shall have no bailiwick in England); namely, Engelard of Cigogne, Peter, Guy, and Andrew of Chanceaux, Guy of Cigogne, Geofrrey of Martigny with his brothers, Philip Mark with his brothers and his nephew Geoffrey, and the whole brood of the same. 51. As soon as peace is restored, we will banish from the kingdom all foreign-born knights, cross-bowmen, serjeants, and mercenary soldiers, who have come with horses and arms to the kingdom's hurt. 52. If any one has been dispossessed or removed by us, without the legal judgment of his peers, from his lands, castles, franchises, or from his right, we will immediately restore them to him; and if a dispute arise over this, then let it be decided by the five-and-twenty barons of whom mention is made below in the clause for securing the peace. Moreover, for all those possessions, from which any one has, without the lawful judgment of his peers, be endisseised or removed, by our father, King Henry, or by our brother, King Richard, and which we retain in our hand (or which are possessed by others, to whom we are bound to warrant them) we shall have respite until the usual term of crusaders; excepting those things about which a plea has been raised, or an inquest made by our order, before our taking of the cross; but as soon as were turn from our expedition (or if perchance we desist from the expedition) we will immediately grant full justice therein. 53. We shall have, moreover, the same respite and in the same manner in rendering justice concerning the disafforestation or retention of those forests which Henry our father and Richard our brother afforested, and concerning wardship of lands which are of the fief of another (namely, such wardships as we have hitherto had by reason of a fief which any one held of us by knight's service), and concerning abbeys founded on other fiefs than our own, in which the lord of the fief claims to have right; and when we have returned, or if we desist from our expedition, we will immediately grant full justice to all who complain of such things. 55. All fines made with us unjustly and against the law of the land, and all amercements imposed unjustly and against the law of the land, shall be entirely remitted, or else it shall be done concerning them according to the decision of the five-and-twenty barons of whom mention is made below in the clause for securing the peace, or according to the judgment of the majority of the same, along with the aforesaid Stephen, archbishop of Canterbury, if he can be present, and such others as he may wish to bring with him for this purpose, and if he cannot be present the business shall nevertheless proceed without him, provided always that if any one or more of the aforesaid five-and-twenty barons are in a similar suit, they shall be removed as far as concerns this particular judgment, others being substituted in their places after having been selected by the rest of the same five-and-twenty for this purpose only, and after having been sworn. 56. If we have disseised or removed Welshmen from lands or liberties, or other things, without the legal judgment of their peers in England or in Wales, they shall be immediately restored to them; and if a dispute arise over this, then let it be decided in the marches by the judgment of their peers; for tenements in England according to the law of England, for tenements in Wales according to the law of Wales, and for tenements in the marches according to the law of the marches. Welshmen shall do the same to us and ours. 57. Further, for all those possessions from which any Welshman has, without the lawful judgment of his peers, been disseised or removed by King Henry our father or King Richard our brother, and which we retain in our hand (or which are possessed by others, to whom we are bound to warrant them) we shall have respite until the usual term of crusaders; excepting those things about which a plea has been raised or an inquest made by our order before we took the cross; but as soon as we return (or if perchance we desist from our expedition), we will immediately grant full justice in accordance with the laws of the Welsh and in relation to the foresaid regions. 59. We will do toward Alexander, King of Scots, concerning the return of his sisters and his hostages, and concerning his franchises, and his right, in the same manner as we shall do toward our other barons of England, unless it ought to be otherwise according to the charters which we hold from William his father, formerly King of Scots; and this shall be according to the judgment of his peers in our court. 60. Moreover, all these aforesaid customs and liberties, the observance of which we have granted in our kingdom as far as pertains to us toward our men, shall be observed by all of our kingdom, as well clergy as laymen, as far as pertains to them toward their men. 61. Since, moreover, for God and the amendment of our kingdom and for the better allaying of the quarrel that has arisen between us and our barons, we have granted all these concessions, desirous that they should enjoy them in complete and firm endurance for ever, we give and grant to them the underwritten security, namely, that the barons choose five-and-twenty barons of the kingdom, whomsoever they will, who shall be bound with all their might, to observe and hold, and cause to be observed, the peace and liberties we have granted and confirmed to them by this our present Charter, so that if we, or our justiciar, or our bailiffs or any one of our officers, shall in anything be at fault toward any one, or shall have broken any one of the articles of the peace or of this security, and the offense be notified to four barons of the foresaid five-and-twenty, the said four barons shall repair to us (or our justiciar, if we are out of the realm) and, laying the transgression before us, petition to have that transgression redressed without delay. And if we shall not have corrected the transgression (or, in the event of our being out of the realm, if our justiciar shall not have corrected it) within forty days, reckoning from the time it has been intimated to us (or to our justiciar, if we should be out of the realm), the four barons aforesaid shall refer that matter to the rest of the five-and-twenty barons, and those five-and-twenty barons shall, together with the community of the whole land, distrain and distress us in all possible ways, namely, by seizing our castles, lands, possessions, and in any other way they can, until redress has been obtained as they deem fit, saving harmless our own person, and the persons of our queen and children; and when redress has been obtained, they shall resume their old relations toward us. And let whoever in the country desires it, swear to obey the orders of the said five-and-twenty barons for the execution of all the aforesaid matters, and along with them, to molest us to the utmost of his power; and we publicly and freely grant leave to every one who wishes to swear, and we shall never forbid any one to swear. All those, moreover, in the land who of themselves and of their own accord are unwilling to swear to the twenty-five to help them in constraining and molesting us, we shall by our command compel the same to swear to the effect aforesaid. And if any one of the five-and-twenty barons shall have died or departed from the land, or be incapacitated in any other manner which would prevent the foresaid provisions being carried out, those of the said twenty-five barons who are left shall choose another in his place according to their own judgment, and he shall be sworn in the same way as the others. Further, in all matters, the execution of which is intrusted to these twenty-five barons, if perchance these twenty-five are present, that which the majority of those present ordain or command shall be held as fixed and established, exactly as if the whole twenty-five had concurred in this; and the said twenty-five shall swear that they will faithfully observe all that is aforesaid, and cause it to be observed with all their might. And we shall procure nothing from any one, directly or indirectly, whereby any part of these concessions and liberties might be revoked or diminished; and if any such thing has been procured, let it be void and null, and we shall never use it personally or by another. 62. And all the ill-will, hatreds, and bitterness that have arisen between us and our men, clergy and lay, from the date of the quarrel, we have completely remitted and pardoned every one. Moreover, all trespasses occasioned by the said quarrel, from Easter in the sixteenth year of our reign till the restoration of peace, we have fully remitted to all, both clergy and laymen, and completely forgiven, as far as pertains to us. And, on this head, we have caused to be made for them letters testimonial patent of the lord Stephen, archbishop of Canterbury, of the lord Henry, archbishop of Dublin, of the bishops aforesaid, and of Master Pandulf as touching this security and the concessions aforesaid. 63. Wherefore it is our will, and we firmly enjoin, that the English Church be free, and that the men in our kingdom have and hold all the aforesaid liberties, rights, and concessions, well and peaceably, freely and quietly, fully and wholly, for themselves and their heirs, of us and our heirs, in all respects and in all places for ever, as is aforesaid. An oath, moreover, has been taken, as well on our part as on the part of the barons, that all these conditions aforesaid shall be kept in good faith and without evil intent. Given under our hand—the above-named and many others being witnesses—in the meadow which is called Runnymede, between Windsor and Staines, on the fifteenth day of June, in the seventeenth year of our reign. 61. Since, moveover, for God and the amendment of our kingdom and for the better allaying of the quarrel that has arisen between us and our barons, we have granted all these concessions, desirous that they should enjoy them in complete and firm endurance forever, we give and grant to them the underwritten security, namely, that the barons choose five and twenty barons of the kingdom, whomsoever they will, who shall be bound with all their might, to observe and hold, and cause to be observed, the peace and liberties we have granted and confirmed to them by this our present Charter, so that if we, or our justiciar, or our bailiffs or any one of our officers, shall in anything be at fault towards anyone, or shall have broken any one of the articles of this peace or of this security, and the offense be notified to four barons of the foresaid five and twenty, the said four barons shall repair to us (or our justiciar, if we are out of the realm) and, laying the transgression before us, petition to have that transgression redressed without delay. And if we shall not have corrected the transgression (or, in the event of our being out of the realm, if our justiciar shall not have corrected it) within forty days, reckoning from the time it has been intimated to us (or to our justiciar, if we should be out of the realm), the four barons aforesaid shall refer that matter to the rest of the five and twenty barons, and those five and twenty barons shall, together with the community of the whole realm, distrain and distress us in all possible ways, namely, by seizing our castles, lands, possessions, and in any other way they can, until redress has been obtained as they deem fit, saving harmless our own person, and the persons of our queen and children; and when redress has been obtained, they shall resume their old relations towards us. And let whoever in the country desires it, swear to obey the orders of the said five and twenty barons for the execution of all the aforesaid matters, and along with them, to molest us to the utmost of his power; and we publicly and freely grant leave to everyone who wishes to swear, and we shall never forbid anyone to swear. All those, moveover, in the land who of themselves and of their own accord are unwilling to swear to the twenty five to help them in constraining and molesting us, we shall by our command compel the same to swear to the effect foresaid. And if any one of the five and twenty barons shall have died or departed from the land, or be incapacitated in any other manner which would prevent the foresaid provisions being carried out, those of the said twenty five barons who are left shall choose another in his place according to their own judgment, and he shall be sworn in the same way as the others. Further, in all matters, the execution of which is entrusted,to these twenty five barons, if perchance these twenty five are present and disagree about anything, or if some of them, after being summoned, are unwilling or unable to be present, that which the majority of those present ordain or command shall be held as fixed and established, exactly as if the whole twenty five had concurred in this; and the said twenty five shall swear that they will faithfully observe all that is aforesaid, and cause it to be observed with all their might. And we shall procure nothing from anyone, directly or indirectly, whereby any part of these concessions and liberties might be revoked or diminished; and if any such things has been procured, let it be void and null, and we shall never use it personally or by another.